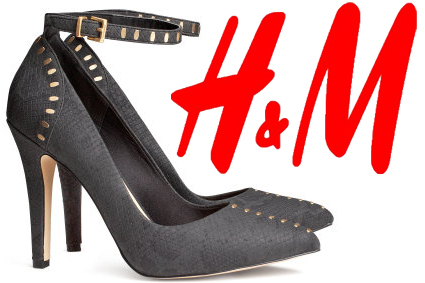 Show Me The Shoes: What To Buy From H&M’s New Online Store! It’s about time that H&M got on board the online retailer train, especially in the United States! While I’ve yet to find the time to do some serious shopping, I can’t wait to see what’s going on around Black Friday & with holiday specials. However, I wanted to share my latest obsession, which is the ankle strap pumps with studs ($29.95)! The ankle strap trend has been all over the red carpet lately & the best way to bring it into fall is with these pumps. Of course, there’s the metallic studding, which automatically brings these from day-to-night, but I also love the animal-inspired embossed texture. Classic black pumps, pointy or round, are essentials for any shoe collection, but if you’re looking for something versatile that you can get a lot of wear from, then I recommend these with any LBD, a 70’s-inspired jumpsuit, or printed sheath dress. For more affordable finds, check out previous posts including a perfect-for-fall polka dot backpack, the new Downton Abbey-inspired beauty line, Lauren Conrad’s latest collection for Kohl’s, & beach-ready accessories for $11 & under! Happy Styling! This entry was posted in Basics for a Bargain, Quickie Darling Deal & Steal, Show Me The Shoes, Style Darling Daily and tagged affordable fashion, ankle strap pumps, H&M, pumps with studs, Quickie Darling Deal & Steal, Show Me The Shoes. Bookmark the permalink. ← Watch This Style: Behind-The-Scenes With Chloe Grace Moretz In Glamour’s September Issue!